Verdict: The Sony MDR-XB650BT are sensibly priced wireless headphones that are part of Sony's "Xtra Bass" range. 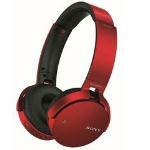 It's the Sony equivalent to Beats, but its pairs tend to sell at a lower price. This isn't really enough to satisfy in such a crowded market. Verdict: The Sony MDR-XB650BT is a decent pair of headphones, and delivers decently-balanced yet powerful audio delivery. The bass bias does sound jarring in certain areas, but for the most part, it succeeds in pleasing you with the audio.